There's a reason why it's hard to find this answer. Sure, it's easy to download videos from YouTube, but doing it legally is another proposition. While there's no law that specifically says you can't download videos from YouTube for free, YouTube's rules are very clear. If you want to download YouTube videos confident in the knowledge that you're on the right side of the law, there's just one way to do it: by signing up for YouTube Red. Among other benefits (including ad-free videos, original shows and unlimited music streaming), YouTube's $10-a-month Red subscription service lets you save any YouTube video for offline viewing. A couple of key restrictions apply when it comes to "offline" YouTube viewing. For starters, you can download YouTube videos only by using the YouTube app for Android and iOS. No PC or Mac downloads are allowed. 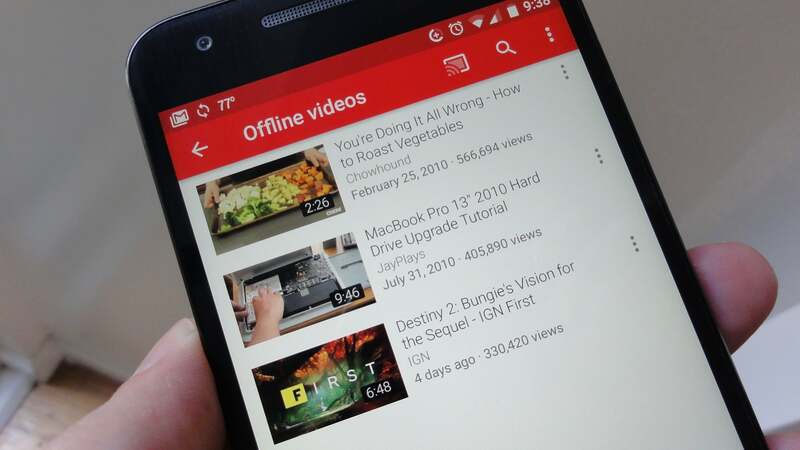 The "offline" videos you save using YouTube Red will (typically) expire after 30 days. While there are strings attached when it comes to downloading YouTube videos via YouTube Red, at least you'll be able to do so without worrying that you've broken the law. You agree not to access Content through any technology or means other than the video playback pages of the Service itself, the Embeddable Player, or other explicitly authorized means YouTube may designate...You shall not download any Content unless you see a “download” or similar link displayed by YouTube on the Service for that Content. What that means, essentially, is that if you try to watch, download or otherwise access videos from YouTube using anything other than YouTube's official interface and buttons, you're violating your user agreement with YouTube. What could happen if you violate YouTube's terms of service? Well, YouTube could sue you for breaking the terms of your user agreement. While there haven't been any reports of such action from YouTube, that doesn't mean it could never happen. And unlikely though it sounds, criminal charges for violating a terms of service—including YouTube's—aren't out of the realm of possibility. A Ninth Circuit Court of Appeals decision from 2012 said breaking a user agreement shouldn't be a crime. Still, the Computer Fraud and Abuse Act could be interpreted (too broadly, some argue) as saying otherwise—and in that case, you'd be looking at a felony, not a parking ticket. Beyond YouTube's terms of service, free YouTube downloaders also face the thorny issue of copyright law. First and foremost is the Digital Millennium Copyright Act, or DMCA, which states that "circumventing a technology measure" to "gain access" to a copyrighted work is illegal. There are "fair use" exceptions to the DMCA for non-commercial research, criticism, commentary, and the like, but it's hard to imagine that downloading (for example) an entire movie would fly, particularly if you never paid for it. Then again, there's the so-called "Betamax case," a Supreme Court decision from the 1980s that paved the way for legal "time-shifting" of copyrighted broadcast shows with VCRs. The Betamax case would appear (as The Consumerist notes) to buttress services like PlayOn, a so-called "streaming DVR" app that lets you record video streams from the likes of Netflix and Hulu. Could the same "time shifting" rationale apply to downloading YouTube videos? Hard to say, but personally, I wouldn't want to be defending myself in court over the question. Finally, bear in mind that we're only talking about U.S. copyright law here. Before you download YouTube videos in another country, check your local copyright laws. Just because scores of legit-looking YouTube downloading sites and apps exist doesn't mean it's legal to use them. 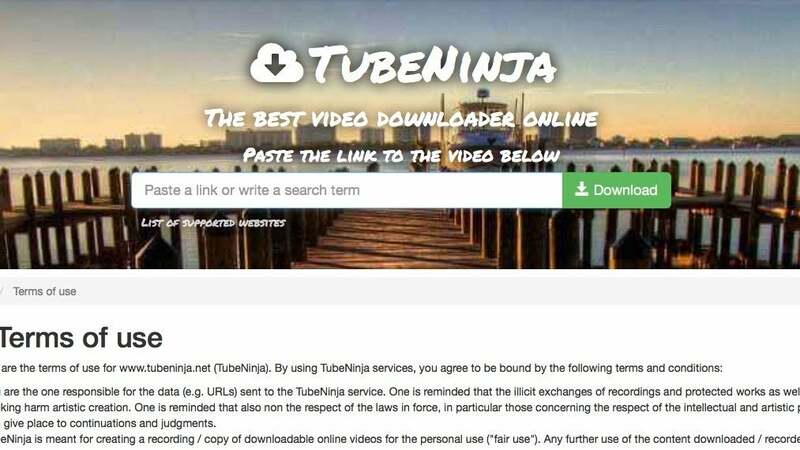 Take TubeNinja, a YouTube downloading site that's still operating despite receiving a cease-and-desist letter from YouTube last summer. TubeNinja offers a tool that lets you plug in a video URL from a variety of streaming services, including YouTube, and save those videos to your hard drive. You are the one responsible for the data (e.g. URLs) sent to the TubeNinja service...The user carries the responsibility for checking the legitimacy of his use of TubeNinja. The legitimacy of using this service may differ in the users country through local laws. TubeNinja only provides the technical platform. Hence, TubeNinja does not take liability towards the user or any third party for the permissibility of downloading content through TubeNinja. The user carries full responsibility for checking the legitimacy of his use of TubeMate...TubeMate only provides the technical service. Hence, TubeMate does not take liability towards the user or any third party for the permissibility of downloading content through TubeMate. In other words, say YouTube downloading services like TubeNinja and TubeMate, if you use our tools, you're on your own if you break any laws in the process.